Need help using this site? Check out this tutorial. What are the computer requirements for this application? Storage: 1.1 GB available space. Some features require an internet connection. Sound Card: Mac OS compatible. How do I access the Living Commentary on my iPhone, iPad or Android device? At this time access for smart phones and other mobile devices is accessed via the web application. 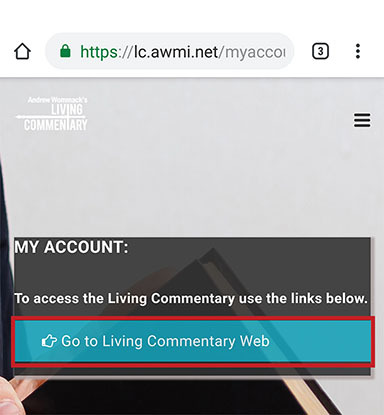 You can directly access this application by going to https://lc.awmi.net/login and after logging in you can click on to the button labeled "Go to Living Commentary Web". How can I purchase the Living Commentary? Please visit https://www.awmi.net/commentary and you can order online. This product will be available on the 1st of April 2019. It took a couple of minutes to receive my activation code. Is this normal? After your purchase and payment are successful, it will take between a minute up to a maximum of 5 minutes to receive the activation code to the registered email address. Please check your junk mail folder in case it was routed to their. I have a question regarding my purchase transaction. Whom do I contact? Should I pay in dollars to buy this product? If you are purchasing outside of the United States, you can use your credit, debit card or Paypal for the purchase and normally you will be charged an equivalent price in your country's currency. Please contact your card issuing Bank/Agency with any questions you have concerning an International purchase on your credit card. Will you ship me the software in a Disk or Thumb drive? Once you have completed the purchase, you will receive, by email, an activation link within 5 minutes. You need to use this code to create an account for yourelf and then you can download the software to your computer. Currently we do not ship the software in either disk or drive formats. I am an existing registered user of Living commentary. Do I need to buy this new software again? For, existing Users there are no additional charge and you will receive instructions via email. I am not from United States, can I purchase this software from some other source? Can I use the same login for the windows app, the mac app and the web app with the same login credentials? Yes, you can login to all of the Living Commentary applications and the https://lc.awmi.net website with the same login credentials. How do I search in this application? You can search by clicking on the search filed in the top left of the application. This will let you search Andrews Notes, other commentaries and scriptures. Do I need internet connection to run the Windows or Mac application? The answer is No, you do not need an internet connection to use Andrew’s Living Commentary that is located on your computer. However, after downloading and installing the application in your system, you will need an internet connection to validate your user ID and password for the first time. You will also need an internet connection to update or sync with new data. I couldn't download the application. Who should I contact for help? We are sorry that you are facing this problem. Please click this link to send your request to our lcsupport@awmi.net. Why am I not able to take user notes in the Web Application? We have not enabled this option at this point of time. Look for this feature in a future update. In each of the two panes, in the upper right side there is the word: “Font” with a number and a arrow drop down box. Click on the arrow drop-down, then choose a Font size. Refer to the demo at the top of this page for additional help with finding how to change the font. Click on your user id in the right top of the web application. This will take you to the profile page and you can change the password there. Is the Web App mobile friendly? Yes, the web App is mobile friendly. Why is there a button named Stats? When you click on the "Stats" button, it will take you to a Statistics page where you will find the number of verses in each book of the Bible and the number of comments written by Andrew Wommack ine ach book of the Bible. Refer to the demo at the top of this page for additional information about the Stats button. What is Treasury of Scripture Knowledge (TSK)? The Treasury of Scripture Knowledge (TSK) is a time-tested Bible help that avoids exposition and interpretation in favor of straightforward comparison of Scripture with Scripture. The TSK can be thought of as the most exhaustive collection of margin cross-references available, but it goes well beyond merely listing additional verses to read: it helps you define words and phrases from within a Bible verse using the Bible itself. Refer to the demo at the top of this page for additional information about the TSK. What is the Resource button for in Andrews Living Commentary? This is where you can see biblical maps and charts as well as other images. Refer to the demo at the top of this page for additional information about the use of the resource button. What are Andrews Life for Today Study Bible Notes? The Andrew’s Life for Today Study Bible Notes are a series of books that Andrew Wommack developed over 25 years ago. Focused on the New Testament of the Bible, Andrew’s Life for Today Study Bible Notes cover 9 Books. (The four Gospels, The Book of Acts, Romans, I & II Corinthians and Galatians.) These Andrew’s Life for Today Study Bible Notes are included in the Andrew Wommack Living Commentary, all of Andrew’s Life for Today Study Bible notes are shown highlighted in green, not all verses have these notes, but many do. Andrew’s work combines the best of many different resources so that the reader will have access to Hebrew and Greek word meanings. Can I add or remove a Bible Version of my choice to Andrews Living Commentary? At this point in time that option is not available. How do I use the Dictionary in Andrews Living Commentary? Click the “Dictionary” button located below the Andrew Wommack Ministries Logo in the upper left-hand side of the screen. In the window that opens you can type or cut and paste a word into the Dictionary “search bar” to find a definition of the word. Refer to the demo at the top of this page for additional information about the Dictionary. How do I use the Concordance in Andrews Living Commentary? The Concordance's are references to the original words in both the greek and hebrew. Both the Strong's and The Englishman's Concordances are available to use. Refer to the demo at the top of this page for additional information about the Concordance. In the Living Commentary by Andrew, why are some links in blue and some links in red? The blue links are links to bible verses and the red links are links to Andrew's commenatry for that verse. Will there will new commentaries added to this application? We plan to keep this application updated and relevant which includes adding versions of the Bible, commentaries and other resources as they become available. How do I know when there is an update available? In Windows® and Mac® applications, there will be a link that appears in the bottom right corner of the page that says “check for latest updates” once clicked it will guide you through the rest of the download process, all at no charge to you. How frequently will Andrew update his notes? You can periodically check for any of Andrew’s Commentary notes by clicking on the “Sync” button. The Sync button is located just below the search bar in the upper righthand corner of the page. This will verify all of Andrew’s comments have been synchronized, at no charge to you. How many Versions of Bible are there in the Living Commentary Application? How do I install the Living Commentary on another computer? 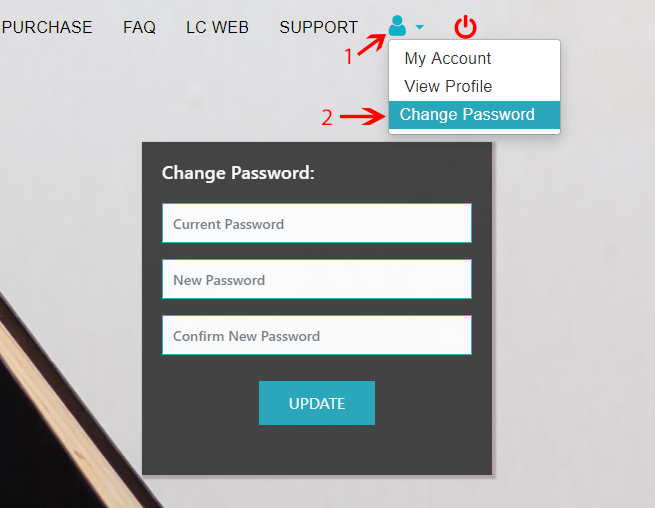 Once you are on another computer whether it is a new or old one, you can login to that computer and download from your Accounts page.